In an attempt to make myself write something/anything, I’m going to, each Monday – probably – write about one thing that happened to me over the weekend. Yesterday afternoon, I was in Chelsea Market standing on line for coffee. This is not a place I go often because it is both far from my apartment and my place of work. But last night I was going to cook dinner with my friends Jen and Liza in honor of the weirdest televised dinner party of the year, the Golden Globes, and Chelsea Market is close to Liza’s apartment and we figured it might be a good place to purchase groceries and coffee to improve our energy levels so that we would actually get around to making dinner. Anyway, this is how I ended up on line for coffee in Chelsea Market, even though it’s not necessarily important to this story. I had a feeling that this particular coffee place was CASH ONLY and so while I was waiting I looked around for a sign that said CASH ONLY and wouldn’t you know they had one and it was framed and everything behind the counter? So, I looked at Jen and Liza and I told them I had to go to the ATM. To which Liza said, “I can spot you.” I really appreciated this but I have weird feelings about people spotting me money because I tend not to remember to pay them back and then when I do remember I feel super guilty, even if it’s like $3. So, I told her not to worry about it and I went to the ATM, withdrew some cash and went back to the coffee place, where Liza and Jen were now waiting for their drinks at the other end of the bar. There was this older white-haired woman with a wooden cane standing sort of to the side of the line when I got there so I asked her if she was in line and she said yes, so I just stood behind her, very quietly, because that’s generally how I am in public when I am alone. The line seemed very slow-moving because 1) it was, 2) I really wanted iced coffee and it wasn’t happening fast enough and 3) the woman in front of me was tapping her wooden cane on the ground like she was either very impatient or performing some shamanistic ritual. This last thing made me anxious. But I know that everything is temporary, so I knew that eventually this tapping would stop. And then it did and the woman was now staring up at me – her face was really close like, almost under the brim of my hat – and talking to me. “You’re really pretty!” she said, smiling a little too maniacally for my taste. I didn’t even get a chance to respond. I mean, I was going to thank her because that’s, I think, what you should say when someone tells you you’re pretty. But then she said, “You’re not from here, are you?” As if I couldn’t be pretty and from New York OR – and I think this is more likely – as if I couldn’t be from New York and in Chelsea Market. “Uh, no, I’m from here,” I said. I was kind of offended. I highly doubted that. Still, I smiled and nodded like a nice, regular human. She turned around and ordered her coffee. I ordered mine. We didn’t speak after that. I immediately told Jen and Liza about what happened because I’m sure I was flattered by the attention. We went on our way, merrily buying all of the things we needed for dinner. It was a lovely evening. But I had a weird day today and now I have to think it was because this lady was a witch. 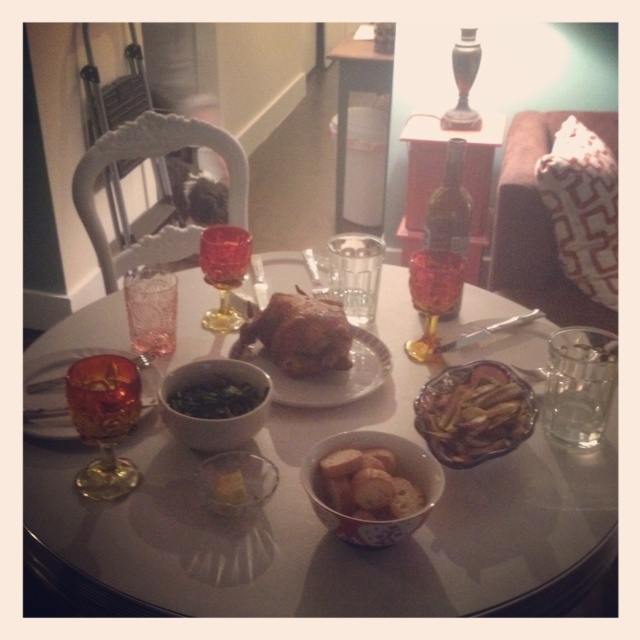 For lack of a better image, here’s what our dinner looked like.